Graham crackers always remind me of my friend Allison, who once gave up “graham crackers at work” for Lent. She also gave up “bread at restaurants” another year, but now I’m getting off topic. What I’m trying to say is that Allison really loves graham crackers. So when she came to visit us in Houston last February, I tried making graham crackers for the first time in her honor. Even though we happily ate them all weekend, they admittedly didn’t really taste like graham crackers at all. Since then, I hadn’t thought about making graham crackers again until recently, when I wanted to make a graham cracker crust for a pie. When I went to the store, all the graham crackers on the shelves had hydrogenated oils in them (this is why I’m not a fan of processed/packaged food), so I decided to give up on the store-bought ones and began searching for a good recipe instead. After scouring my cookbooks and favorite food blogs, I was disappointed to find that a lot of recipes for graham crackers contain all-purpose flour, which seems inauthentic to me, especially after reading about the history of graham crackers. So when I finally found a version that used all whole wheat flour, I had high hopes. After some slight alterations, the recipe is perfect, and I can’t tell you enough how delicious these graham crackers are. In my version, I use a mix of whole wheat flour and whole wheat graham flour. Graham flour may be a little hard to find in stores, but it’s worth tracking down even if you have to order it online. You just won’t get the same texture and flavor without it. Turbinado sugar, honey, vanilla, and cinnamon also help create that quintessential graham cracker flavor. Now that I have a great recipe, I need my friend Allison to visit again so that I can redeem myself and give her some proper homemade graham crackers. 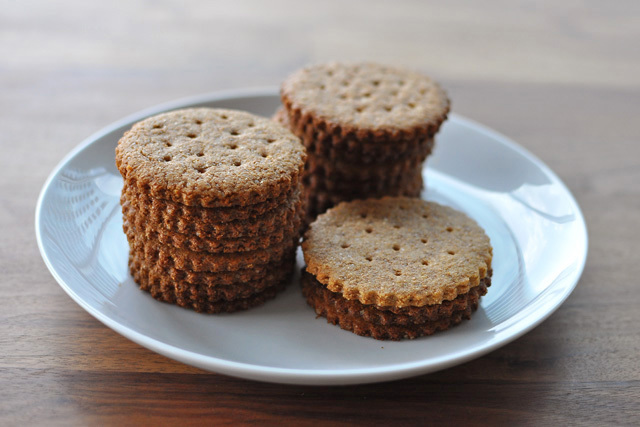 When these graham crackers are baked perfectly, they will be a lovely shade of brown and crisp throughout. Under-baking will cause them to be soft in the center and over-baking will cause the honey to burn, and the bottoms and edges to caramelize too much. Heat the oven to 350 degrees and line 2 baking sheets with parchment paper. In a large bowl or stand mixer, mix together the whole wheat flour, graham flour, turbinado sugar, baking powder, baking soda, salt, and cinnamon. In a small bowl or glass measuring cup, mix the lukewarm water and the honey until the honey has dissolved. Add the honey-water mixture, vanilla, and melted butter to the dry ingredients and mix until the dough comes together. Divide the dough in half, and form each half into a 1/2-inch thick disk and wrap with plastic wrap. Chill for about an hour, or until the dough is firm enough to roll out. Once the dough has chilled, roll the dough out between 2 sheets of plastic wrap (or between a Silpat mat and a piece of plastic wrap), until the dough is about 1/8-inch thick. 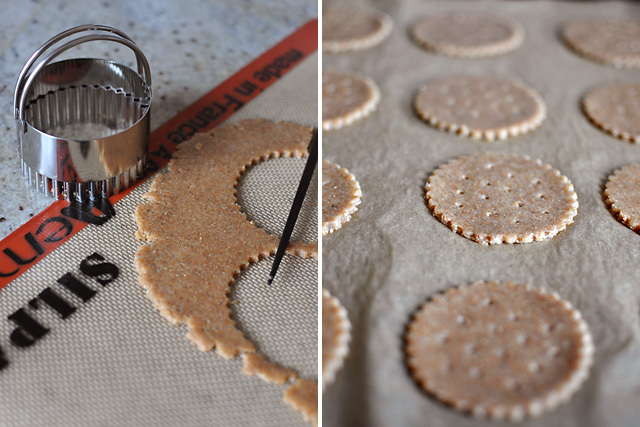 Use a 2 1/2-inch cookie cutter (I use a round fluted one) and cut the crackers out, rerolling the scraps as needed. Place them on the baking sheets and poke holes on the top of the crackers using a chopstick or similar device. Chill the crackers for a few minutes in the fridge before baking if the dough gets too warm. Bake for about 12 to 15 minutes or until they are just starting to brown and are slightly firm to the touch. They will crisp up more as they cool. Transfer the crackers to a wire rack to cool completely. Makes about 30 2 1/2-inch cookies. Love the fluted edges and holes on the graham crackers. I plan on trying your recipe and making some vanilla marshmallows for s’mores this 4th of July. Of course, you can buy digestive here (I assume you mean in the US) – I live in San Diego and I frequently go to World Market for my fix of McVities Digestive Biscuits or you can order them via Amazon.com. Personally, I don’t think that Graham crackers taste anything like digestives biscuits, nevertheless, they (Grahams) are tasty in their own right. your graham crackers look perfect! I found your blog via wolfeyebrows (Cath’s blog) and love your photography!